So much has flowered this month it has been impossible not to walk around the garden without finding another plant that has begun to flower. 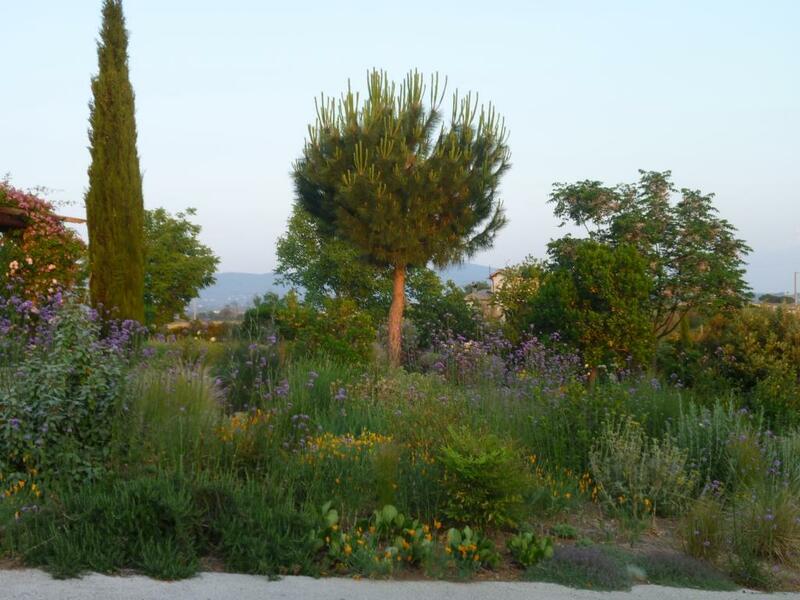 Our hot dry weather has continued for the whole month; and even when I can see rain falling only a few kilometres away nothing has fallen on My Hesperides Garden! The ground was already dry as this winter there was hardly any rain at all. A year ago it was very different (then we’d had almost a whole year of rain except of course for July and August when it rarely rains in Lazio). 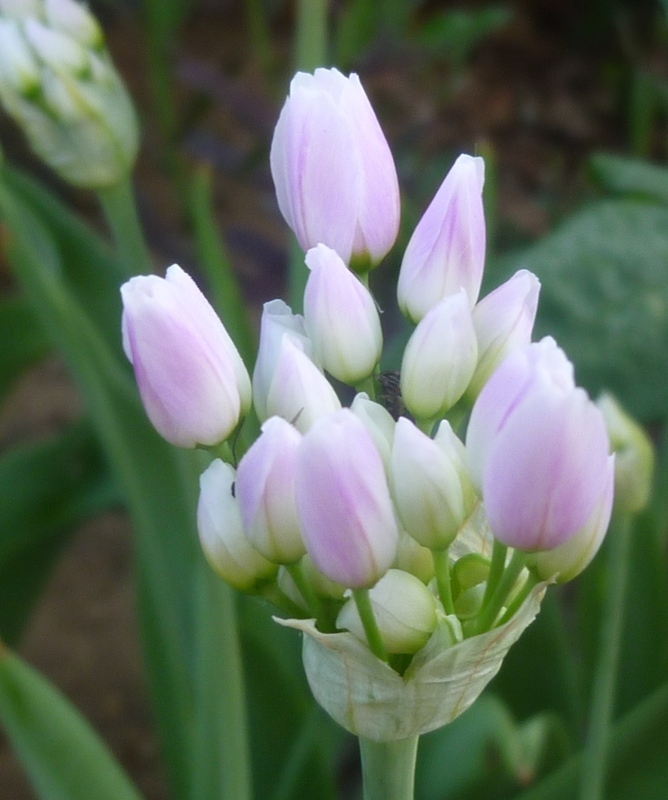 By the beginning of May all the tulips were finished, a very short show this year but enjoyable all the same. 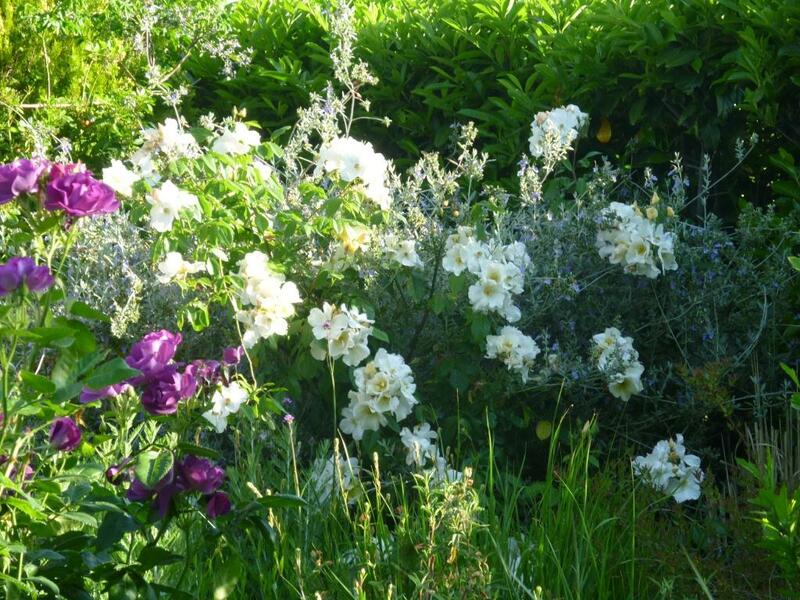 Then in very quick succession Irises, Allium and then of course, May means roses. 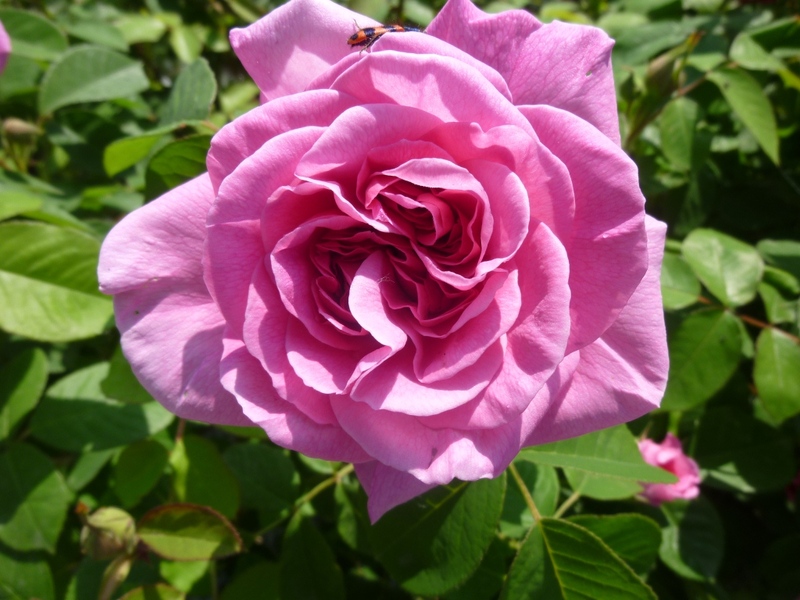 Last Monday I was a judge at an International Rose competition and I have to say that it made me realise how many bad roses enter into the market without having any additional value than the thousands that already exist. 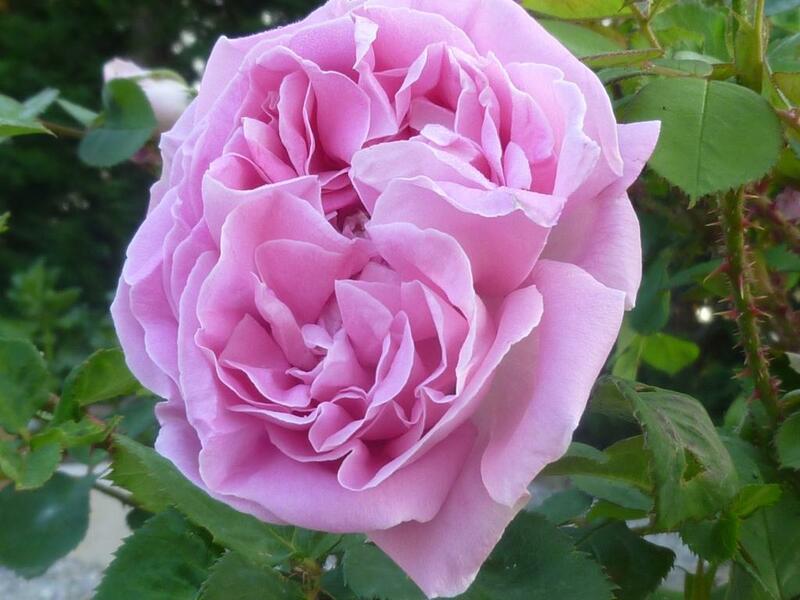 We were judging roses that had been in commerce for less than 5 years and apart from perhaps one or at most two of those being evaluated I don’t think they merited inclusion ion any garden. 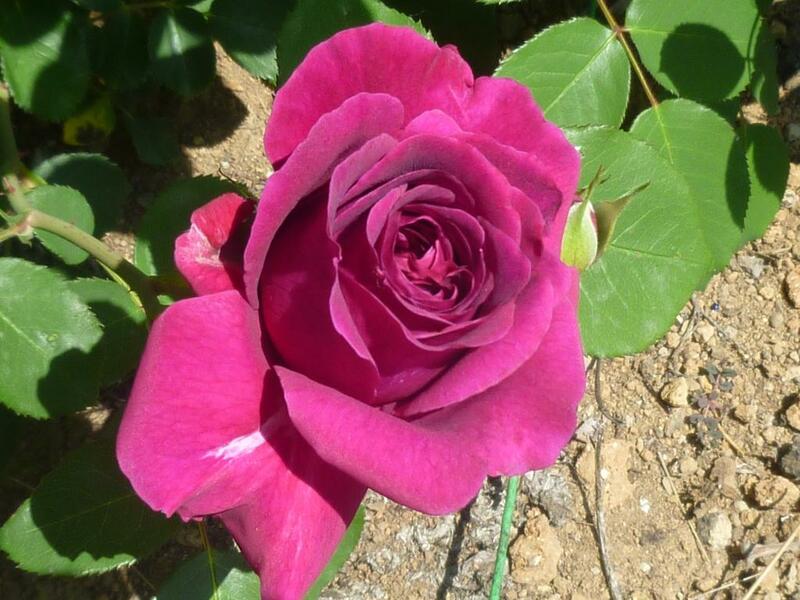 It certainly made me appreciate my own roses even more and made me happy with my choices. 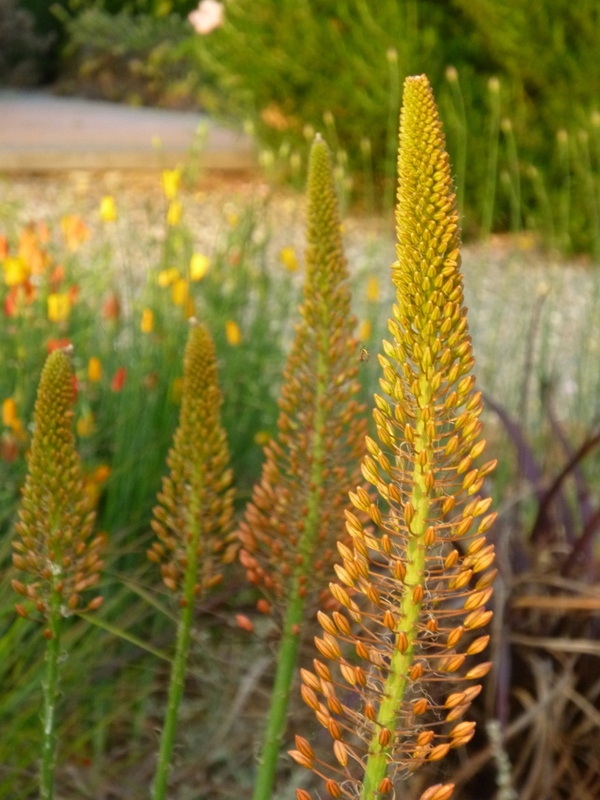 For the first time some of the Eremurus I planted 2 years ago have flowered. 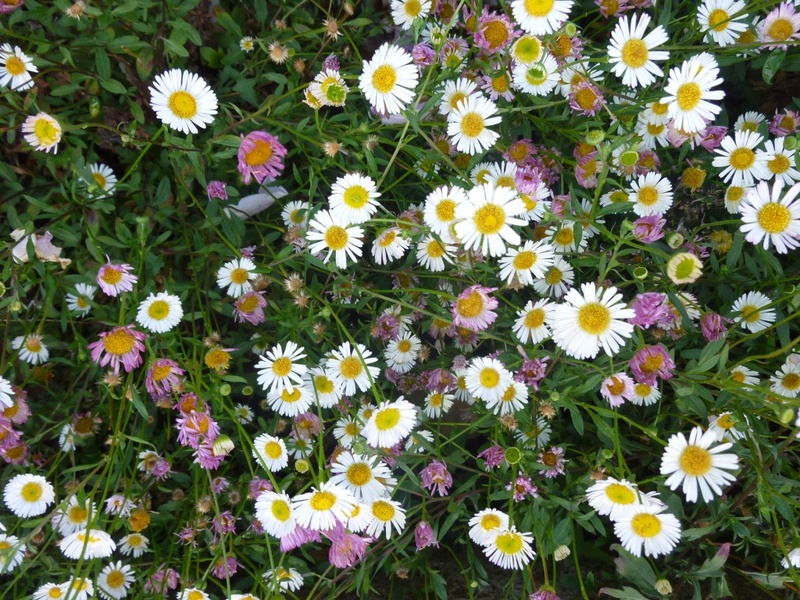 Either they liked the cold this winter or the lack of rain – I like them but think they are probably too fussy for me to purchase more, maybe they will spread by themselves, I hope so. 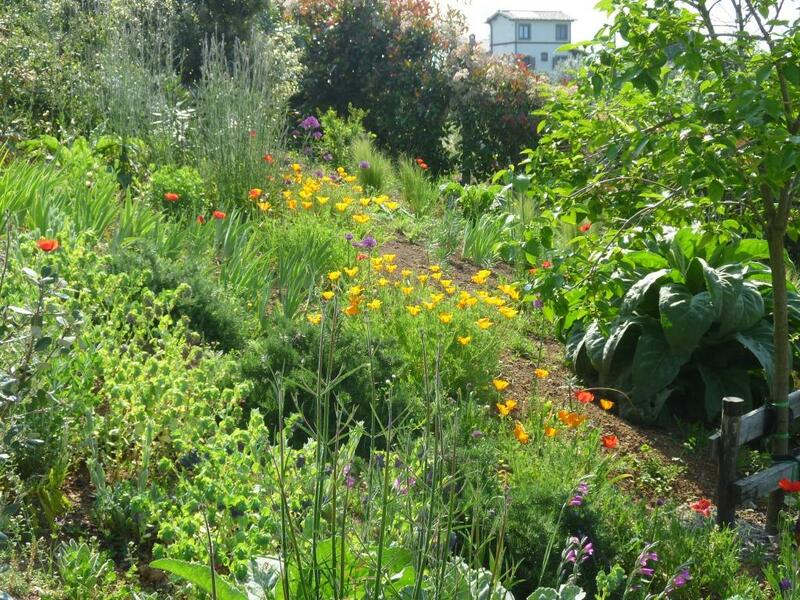 Now on to the slope, the part of the garden I usually concentrate on for the EoMR. 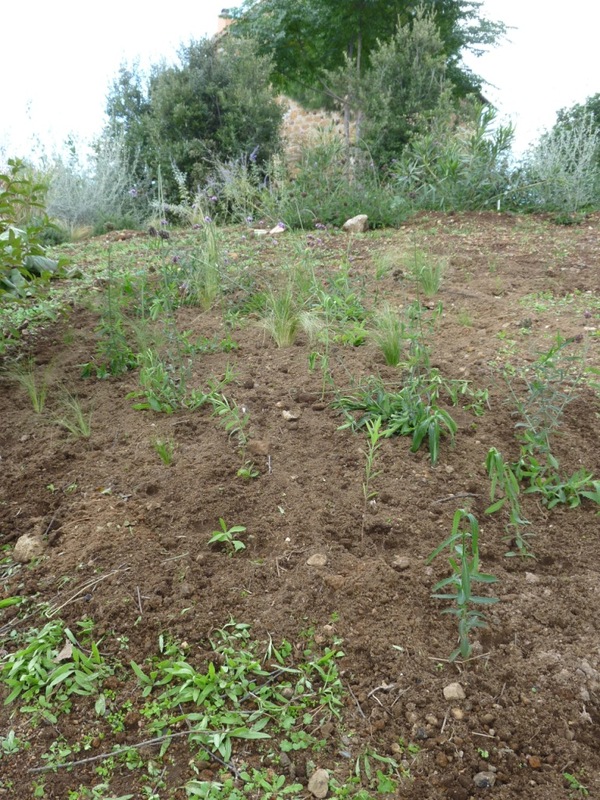 Here is the slope when I first planted Stipa, Gaura and Verbena bonarienis last November. Everything has grown much more than I could have hoped and it is looking how imagined it would look in a couple of years’ time. 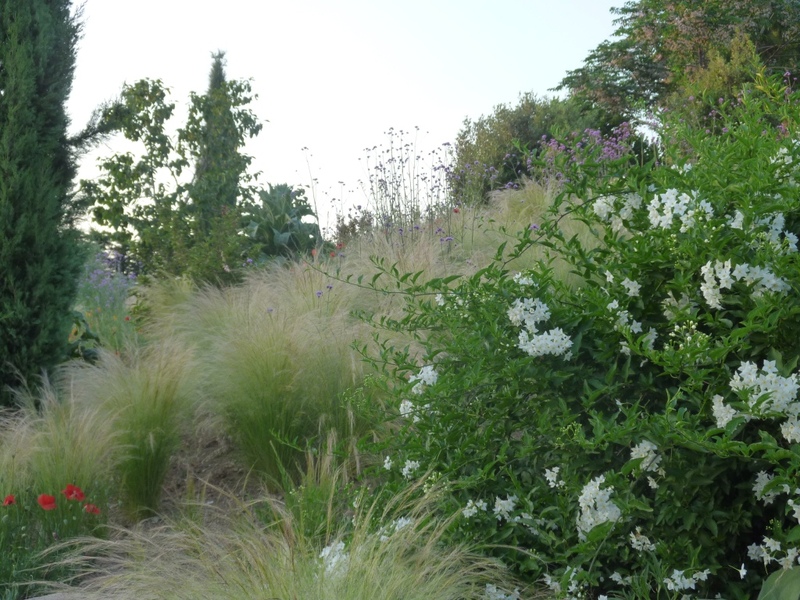 The effect of a meadow or prairie is strong especially with Stipa tenuissima blowing in the wind. 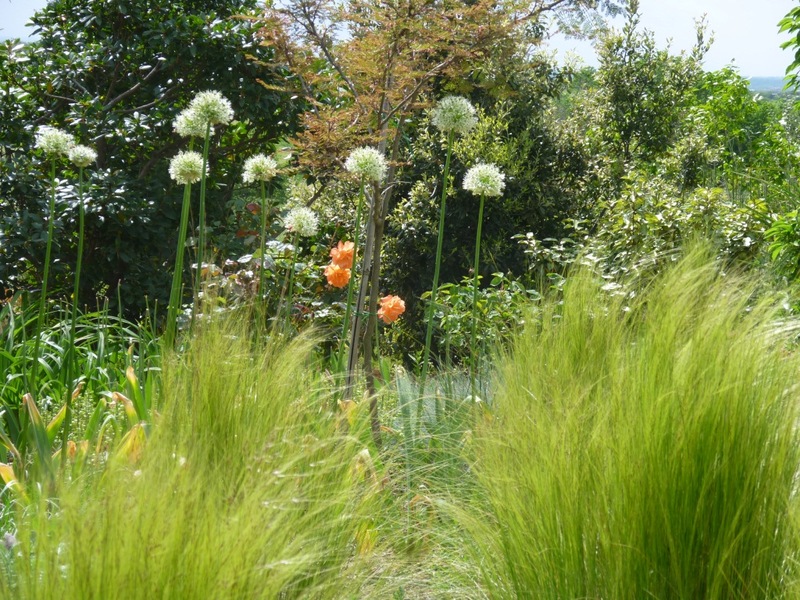 Stipa now - just look how much its grown! 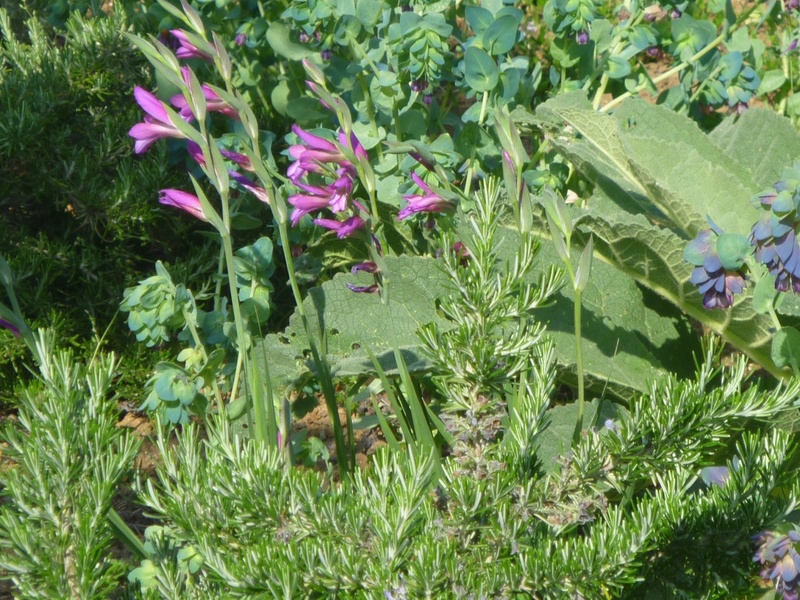 As always there are some happy accidents, I found some loose bulbs at the bottom of the box and thought they were allium so added them to the ‘stream’ flowing down the slope but I was wrong they were Gladioli byzantinus – I love the contrast in colour with the Cerinthe and large grey leaves of Verbascum. 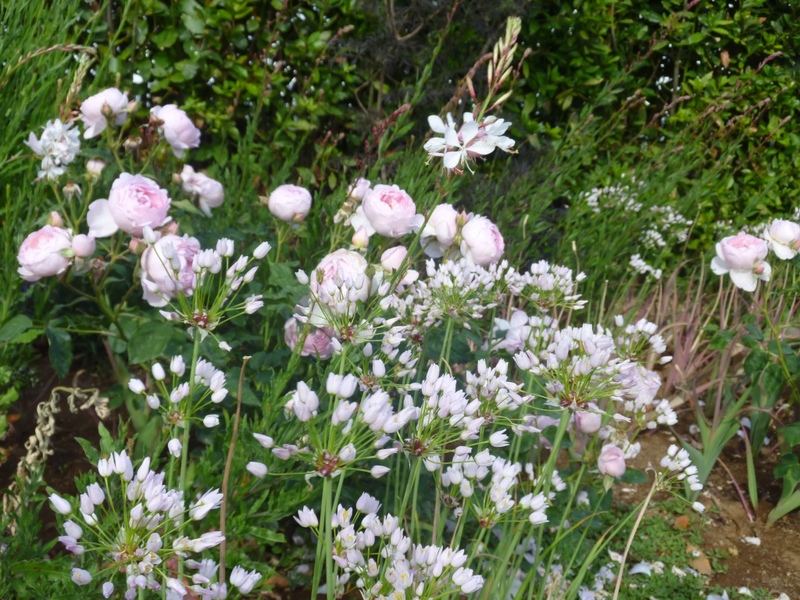 The Gaura is also beginning to flower, a few plants didn’t survive ants mining under them, but there are enough and I have more I can add if necessary. What do I need to do to improve the planting? I’m very satisfied already and I don’t want to add too many different plant species to the mix. I’ve already planted the cuttings of Solanum jasminoides album I took last autumn and they are growing, I’m longing for the mass of frothy white flowers that will flow from the top of the bank to the bottom in future years. At the moment I think I need to just wait and see what happens. The Cerinthe are looking well past their best, but I’ll leave them to set seed and hope they plant themselves in an interesting way; the same for the poppies, both Californian and European. 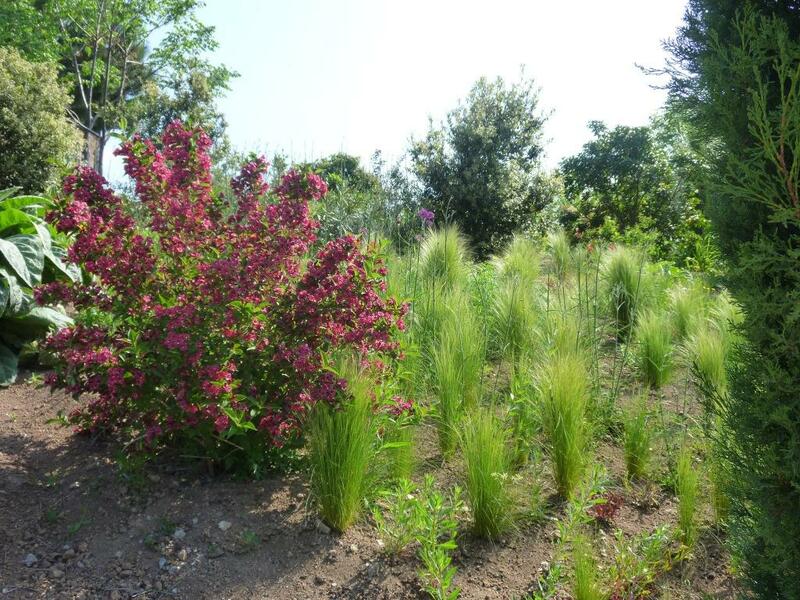 If the Stipa get s too big I’ll just pull it out and allow seedlings to grow where they choose. 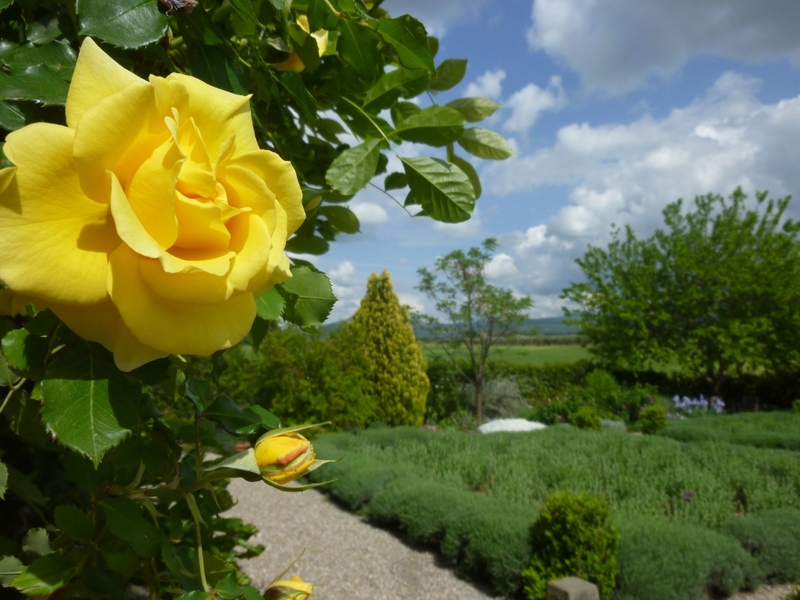 Just to finish a couple of views across the garden and a rose that grows wonderfully in hot climates but doesn’t like damp, cool weather so isn’t often grown in the UK. 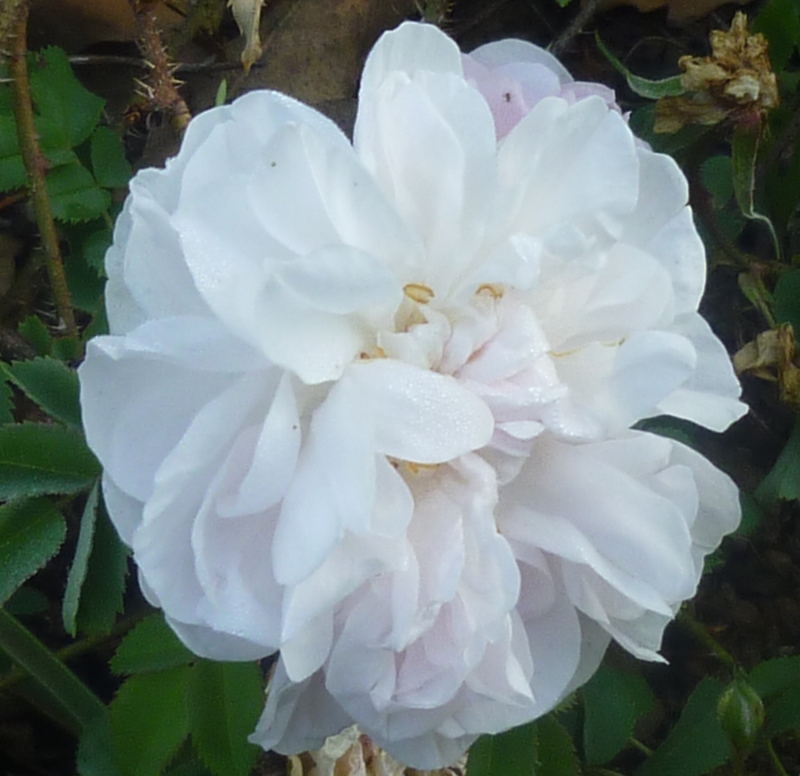 R. Sally Holmes, I have three in the garden that were cuttings from a friend 4 years ago. 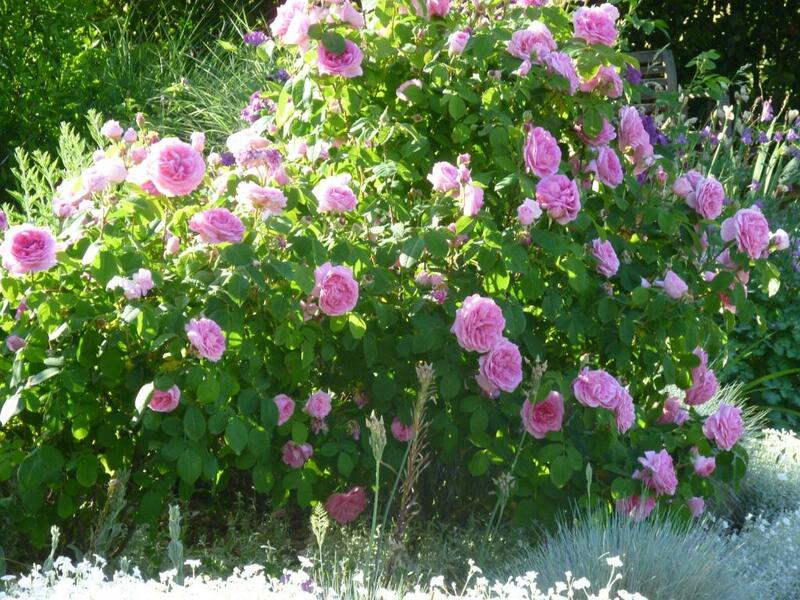 Thank you Helen at Patient Gardener for hosting the End of Month View this month. 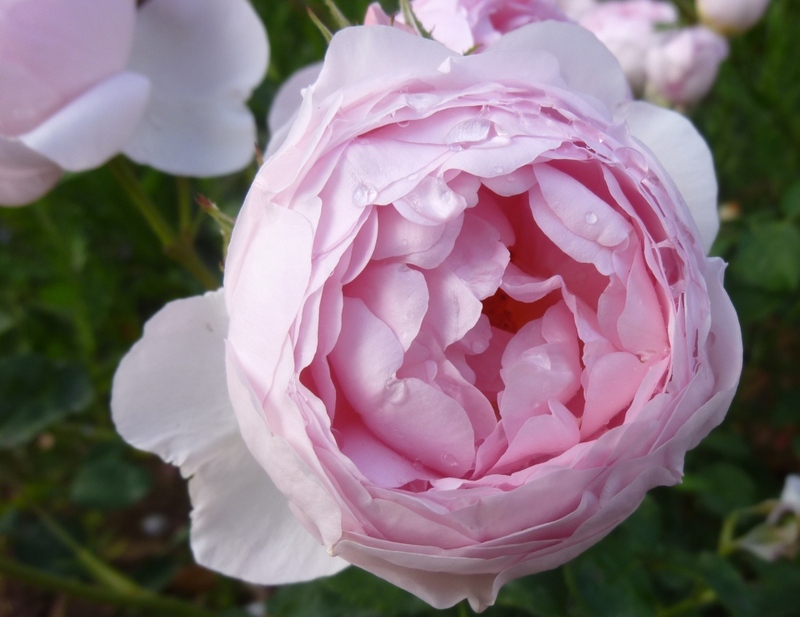 Visit her to see what others are planning and doing in their gardens this month. May is probably the month when there is the most in flower on any one given day, so again I’ll let you see everything via a slideshow, rather than filling this up with everything. This week the weather has thrown itself at the garden. 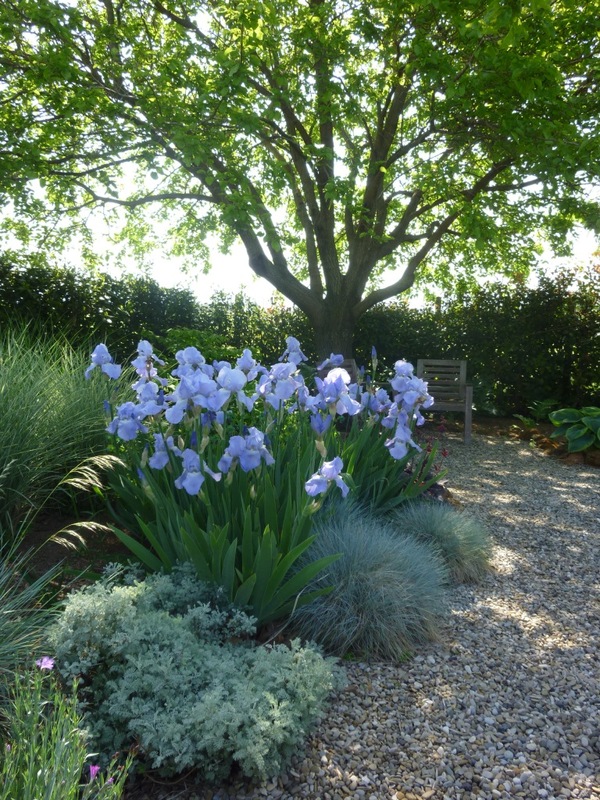 From bright sun with a cold north east wind which blew fragile stems horizontal to 2 hot days that felt more like mid-July with temperatures reaching 30°C to today, windy, dull with rain for about 3 hours over lunch time when I’d been hoping that my guests could have lunch in the garden. 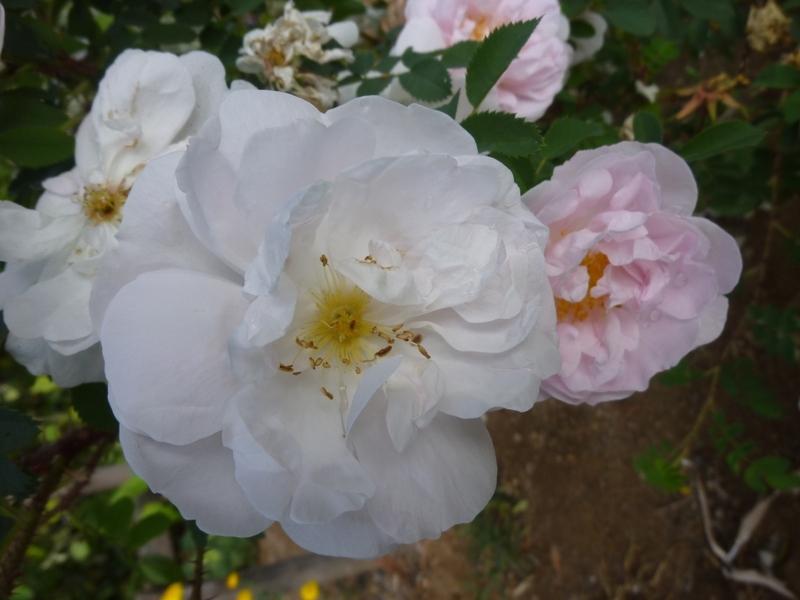 The above image and the following close ups are all taken of what I rather boringly call the Triangular Rose Bed (I do need to take advice about how to name the borders in a more descriptive, interesting way). 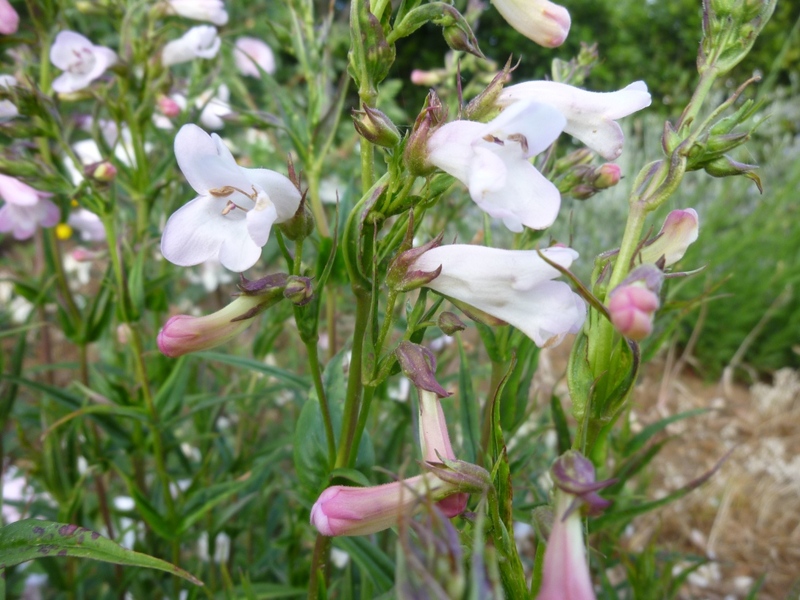 Above pale pink Penstemon began flowering this week and will hopefully now continue until the autumn. 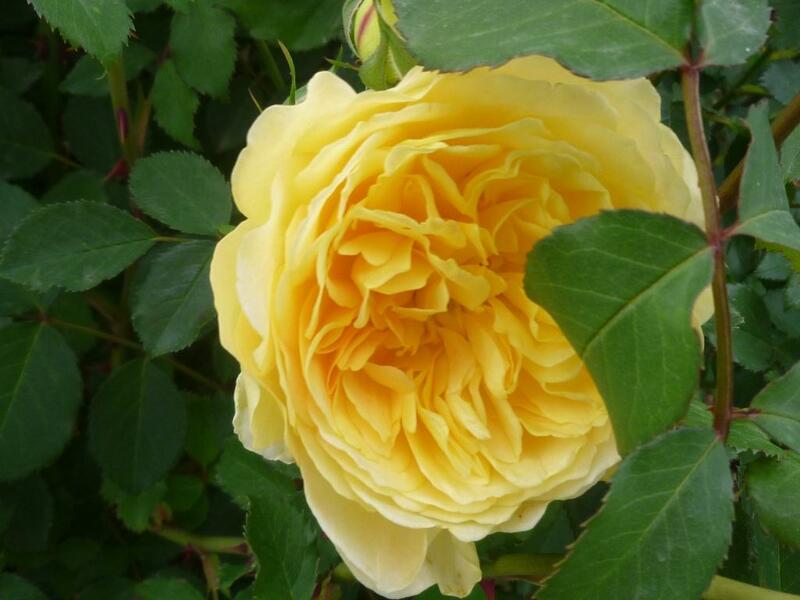 R. Scepter'd Isle, a very good repeating rose, the plants are still new and small (planted last spring) but are full of flower! Looking at the above colours, perhaps I should call it the “Pink, Frilly Knickers Bed”; all pastel pinks with just a hint of dark lace edging supplied by the dark purple cut-lace foliage of Sambucus. 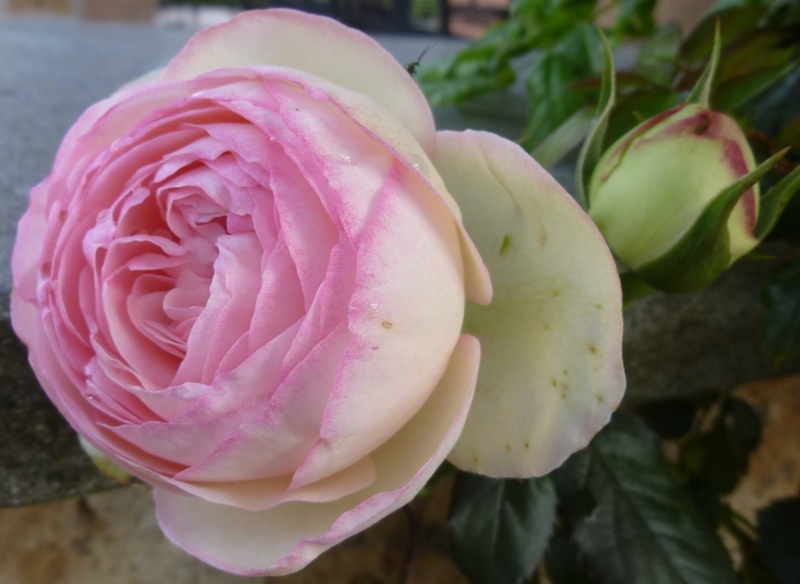 Nearby on 2 pillars is R. Pierre di Ronsard – this has been slow to establish but given its NE facing location and the terrible soil its planted in, I think it’s not doing too badly. It continues the pastel hues. 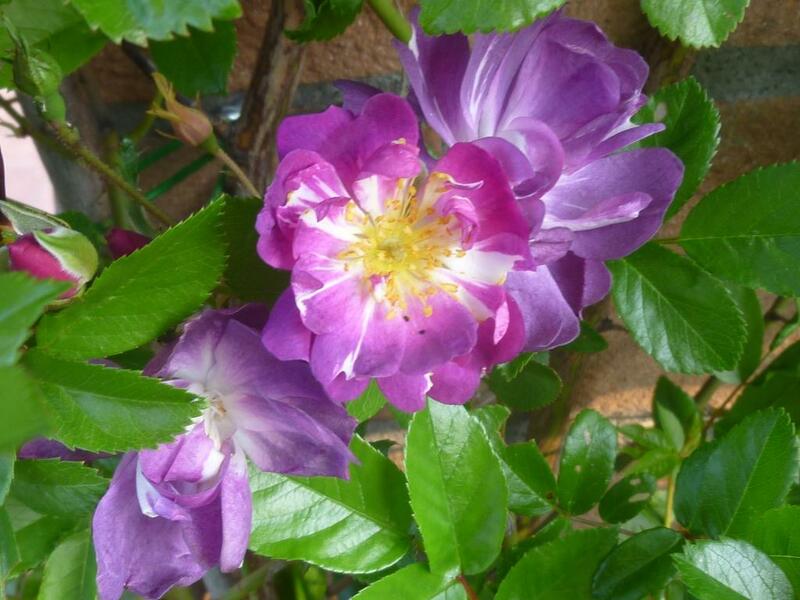 As I mentioned in earlier posts about roses, here and here my roses are about two weeks early flowering, even Veichenblu is half out and last year wasn’t fully flowering until I came home after the Chelsea flower show. 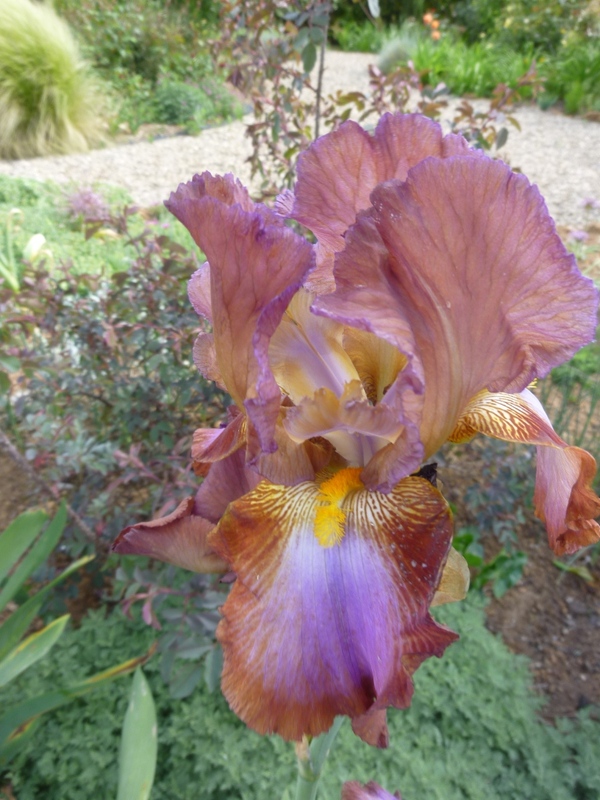 Irises have such a short season but some seem to flower for longer than others (I need to learn more about how they all perform as they are perfect for the conditions here and I do also like their leaves and the strong verticals to add to the show. 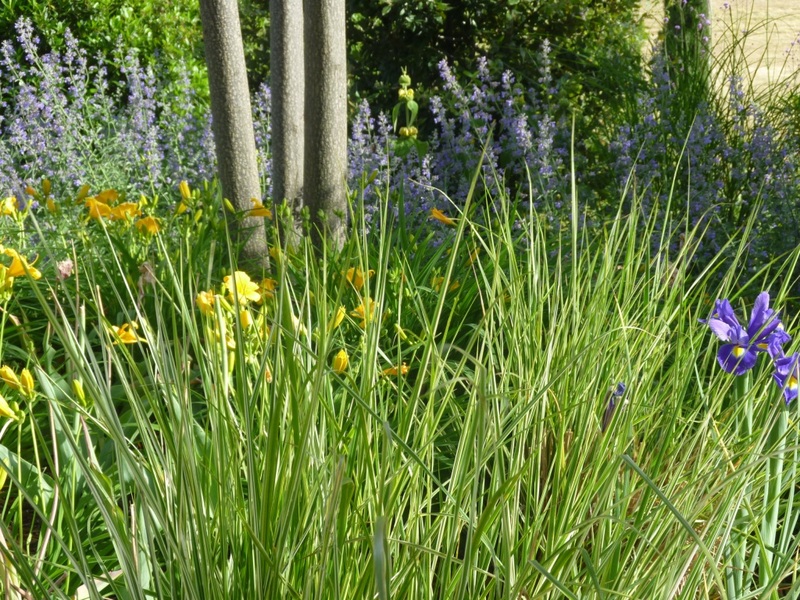 The hazy blue of Nepeta behind the strong yellow of Hemerocallis Sol d’Or with spikes of purple salvia in the foreground and yellow Phlomis all under a Melia tree (I forgot to photograph the blossom on that); you may recognise that it was in amongst these Hemerocallis that Tulips are planted. This proved a great combination as the Hemerocallis foliage started to really grow just when I needed to hide the ugly dying foliage of the tulips. I had chosen tulips for planting here that would have toned in colour with the Hemerocallis had they flowered together. It is a combination I’ll repeat in future years. Walking around after my guests had gone photographing all that you see here I became even more aware of the fact that while I love many of the individual flowers either for their colour or perfume what really made me happy were the general views; seeing how the plants related to each other – their colours blending or contrasting, their foliage texture adding depth and the blurring of colours together not just in the images but also in reality because of the movement caused by the wind. 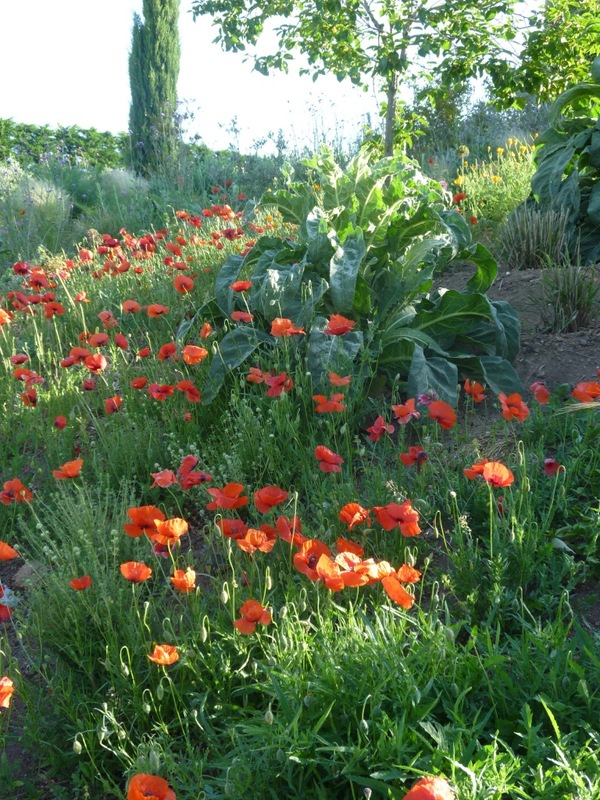 Please click on the image below to see all the flowers in My Hesperides Garden this May GBBD. world. Thanks for hosting GBBD again, Carol and I hope this May is all you dreamt of during the long winter. 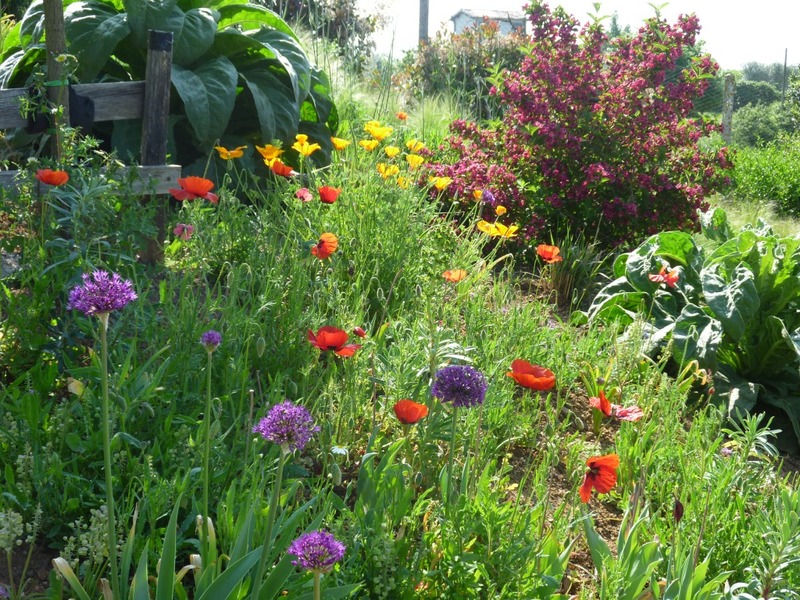 More Alliums and Roses are flowering now as are Irises. All the Irises have flowered in the last week. They are a new love of mine. 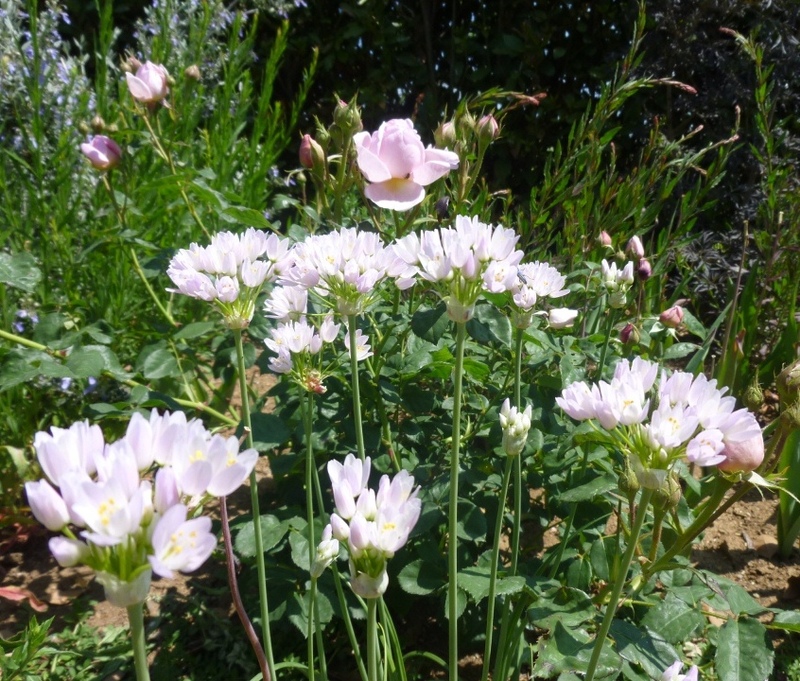 In the past I thought they were rather difficult to mix with other plants and that, as they flower for such a short time, they weren’t worth the space. 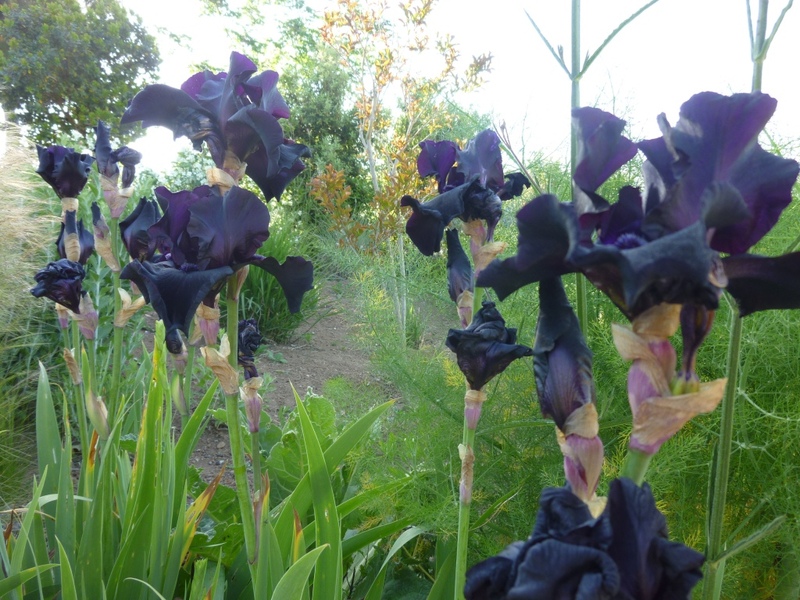 When I first began this garden a kind friend gave me some Irises; actually he gave them to me before I was ready and they sat for a while waiting to be planted. How glad I am that they survived my mistreatment! They are now very happily established and I’m sure the pale blue, brown (Maid of Kent, I think), have both more than doubled their clump size since last year. Two years ago he sold me some other rhizomes, one an amazing pink (that description doesn’t do it justice) and a true black, these have also doubled their clump size; a rather good purple is rather slower but I’m sure it will grow this year now it has flowered. 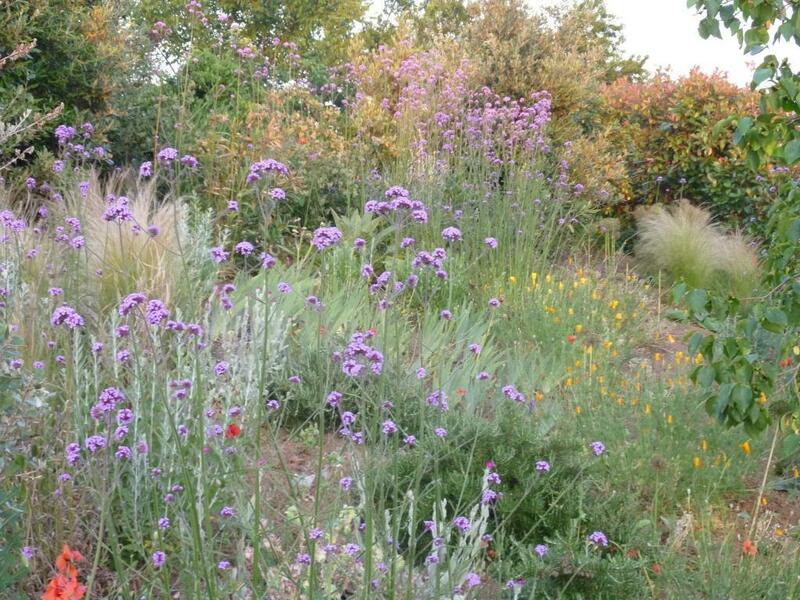 So now I’m looking at on-line brochures to check other colours that might give the right effect in other parts of the garden. 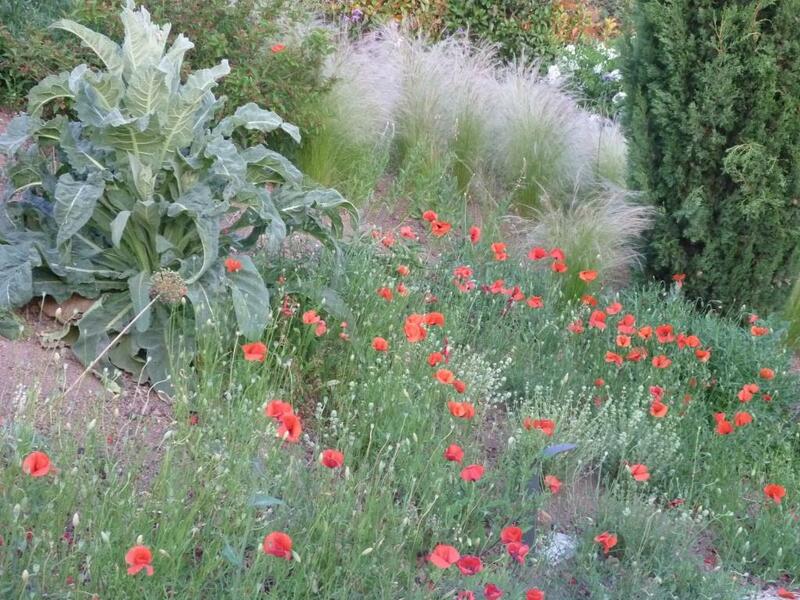 I’m thinking burnt orange for the back border which would benefit from some colour at this time of year, after the tulips and before the Hemerocallis and Abutilon. 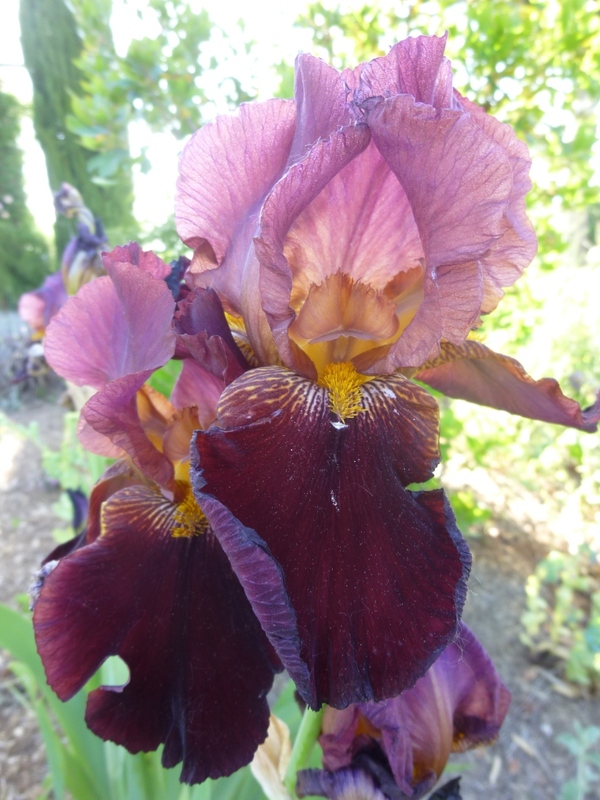 Brown Iris - last year at Chelsea almost every garden had this one! 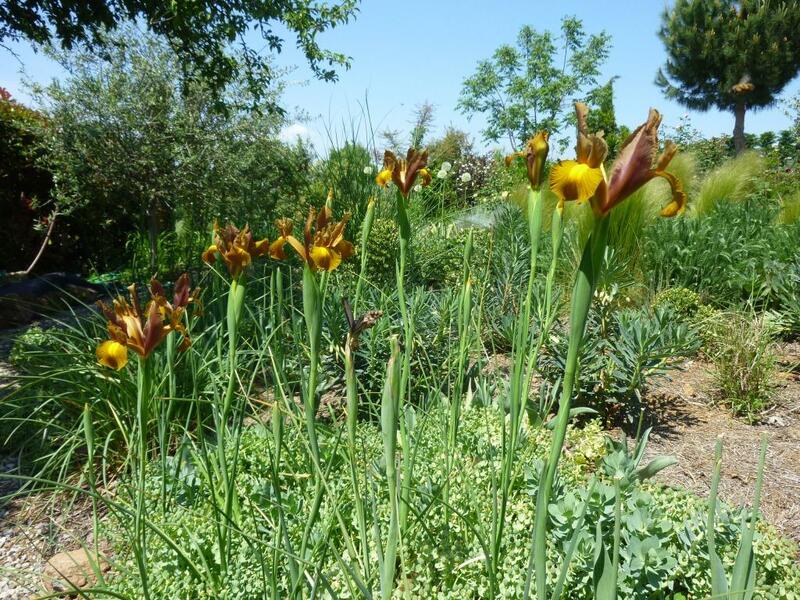 The brown Irises combine very well with the new growth tints of Nandino, and with bronze fennel, I’ll move the Irises closer to the Nandino when they’ve finished flowering (I said I’d do it last year but somehow ran out of time and I’m regretting it now. Yes, they really are black, stunning! 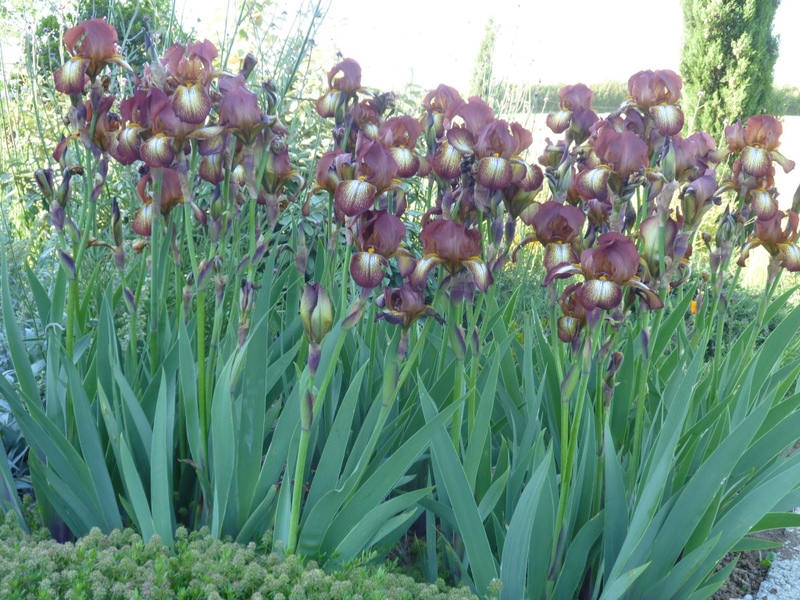 These Dutch Iris Bronze Queen look better in the photo than in life where they look a bit sickly to me. The above are now almost horizonal due to the terrible winds of the last two days. Blue Dutch Iris are also planted near Hemerocallis Sol d’Oro but they’re not fully out yet so I post their image another time. 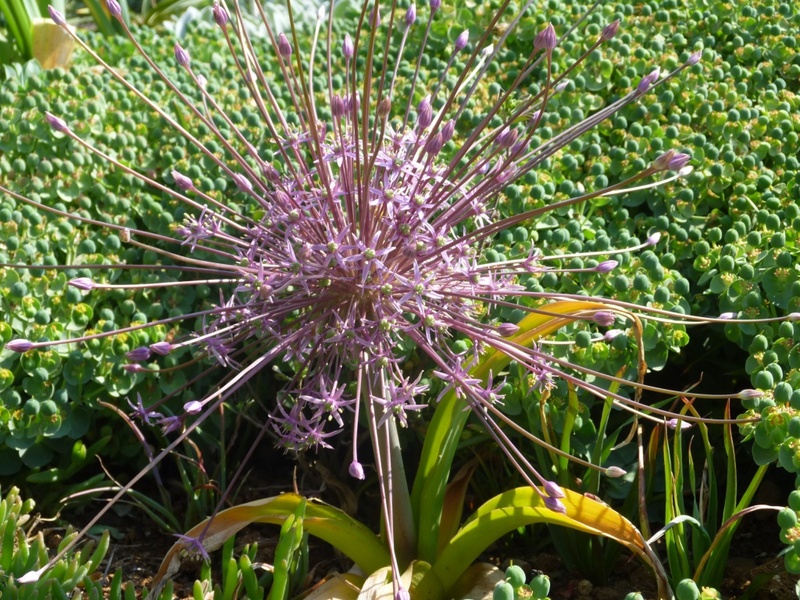 This year Allium karataviense looks even better than last year when it was its first year. 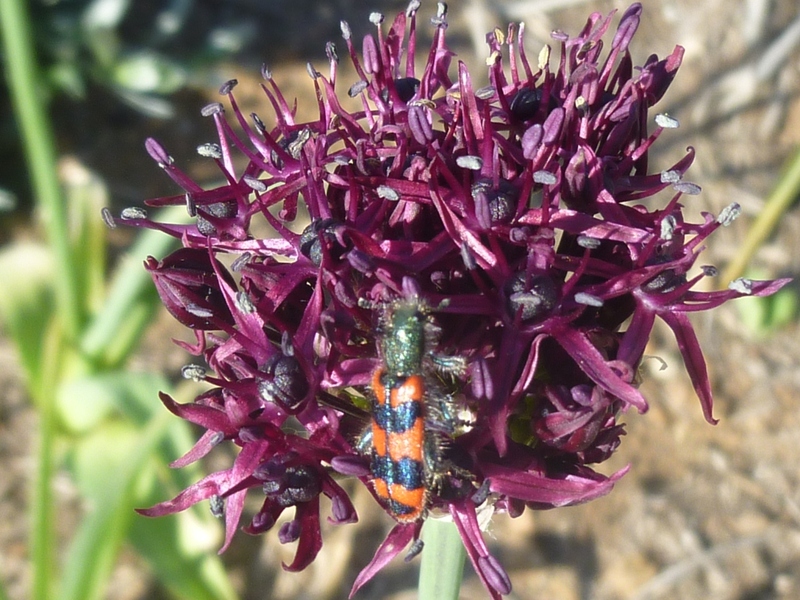 I have always loved the crimson edged, almost blue-green foliage; it has the advantage over other alliums that the foliage remains looking good while it flowers. It even seems to be clumping up so I’m hopeful that it will keep growing for some years. Not so A. aflatunense which has not re-flowered well in the formal beds leading me to think I might plant something else instead. 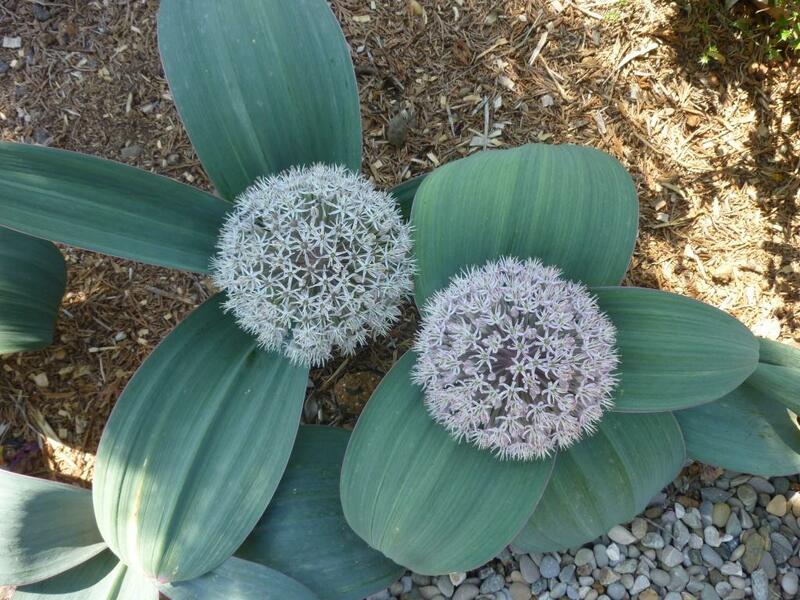 New for me is Allium Roseum planted in the middle of a group of 3 Rose Scepter’d Isle. Small and dainty it resembles the wild alliums I’ve seen growing in various places, although this is more pink as the name would suggest. 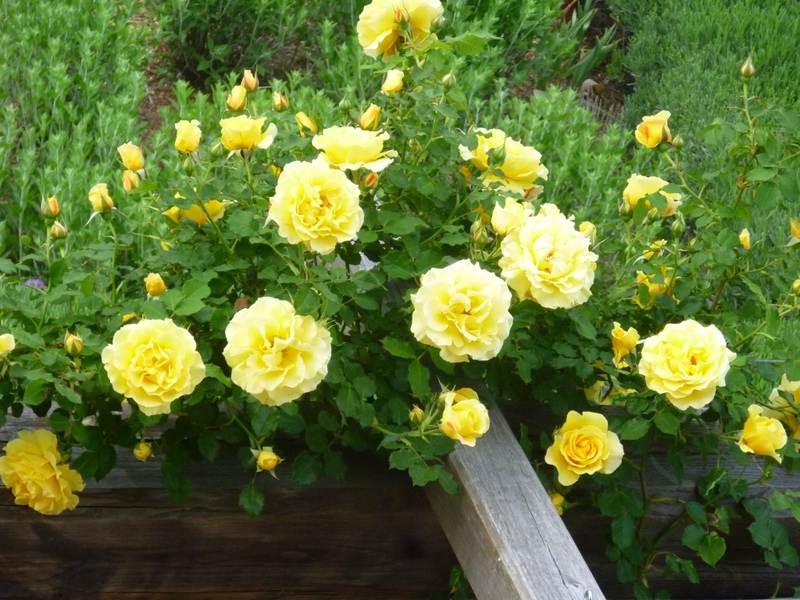 Then, of course, there are the roses. 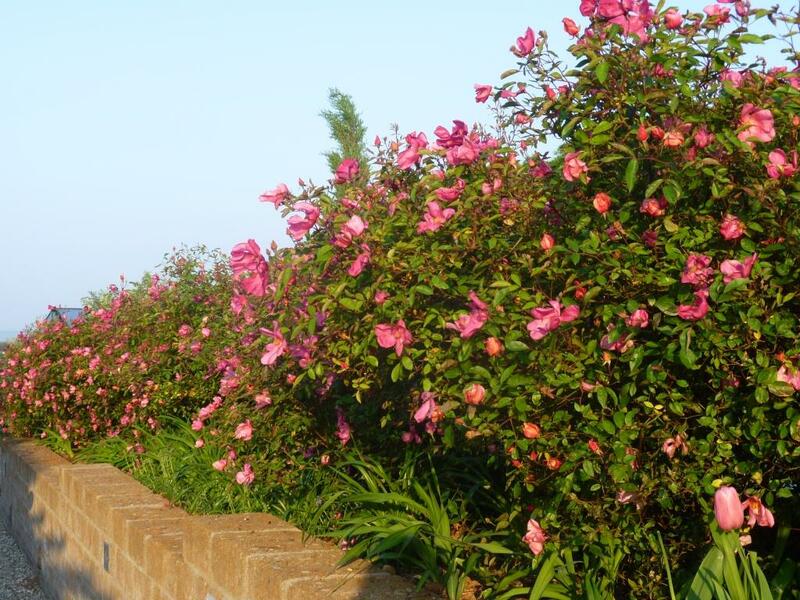 All of them have at least some flowers with most now in full bloom! 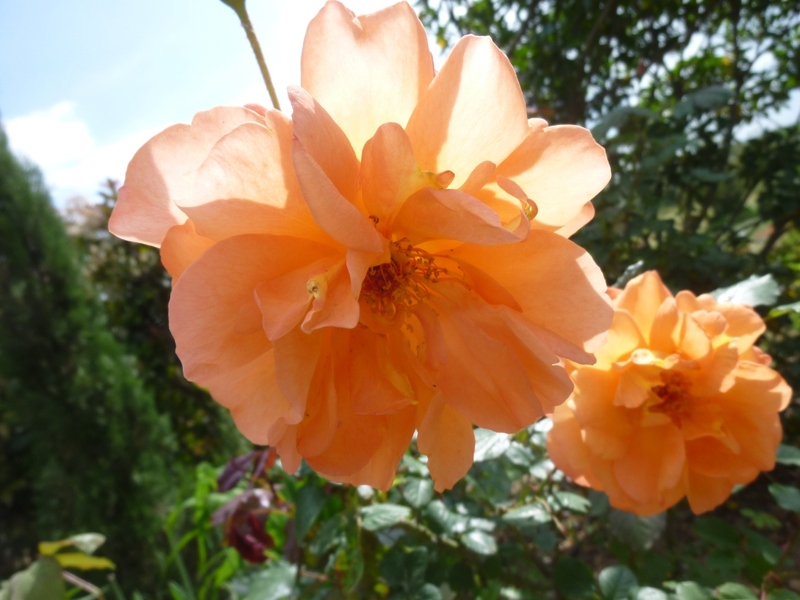 Above is Rosa Westerland, which seems to me the colour of the sunsets we have here. 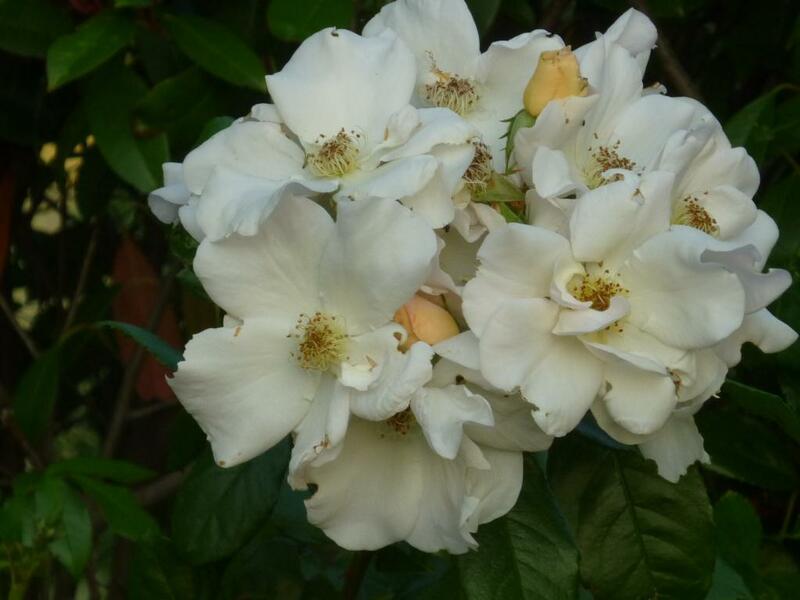 R. Tradescant has more flowers on one bush at this moment than the one I had in England had in 3 years! …..and for something completely different, here’s what mother Nature can do when left to her own devices! 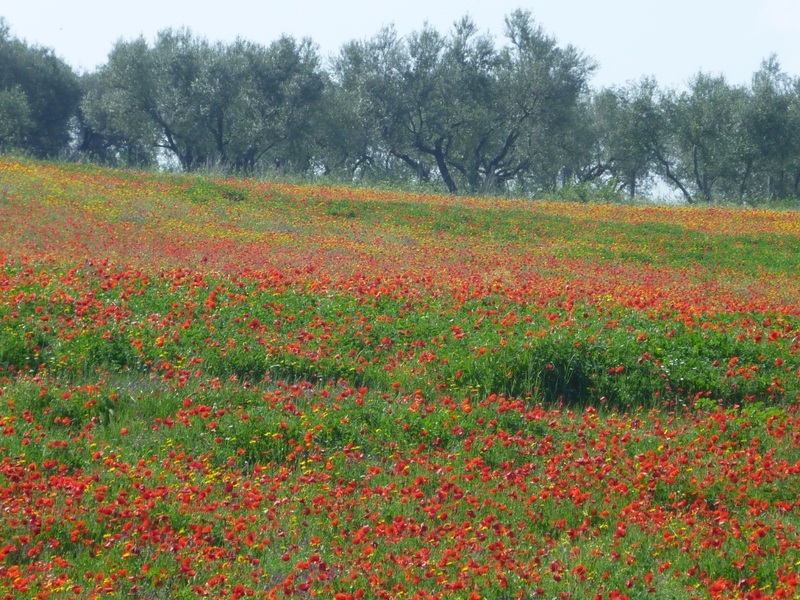 I pass this wonderful field of poppies every time I go out. 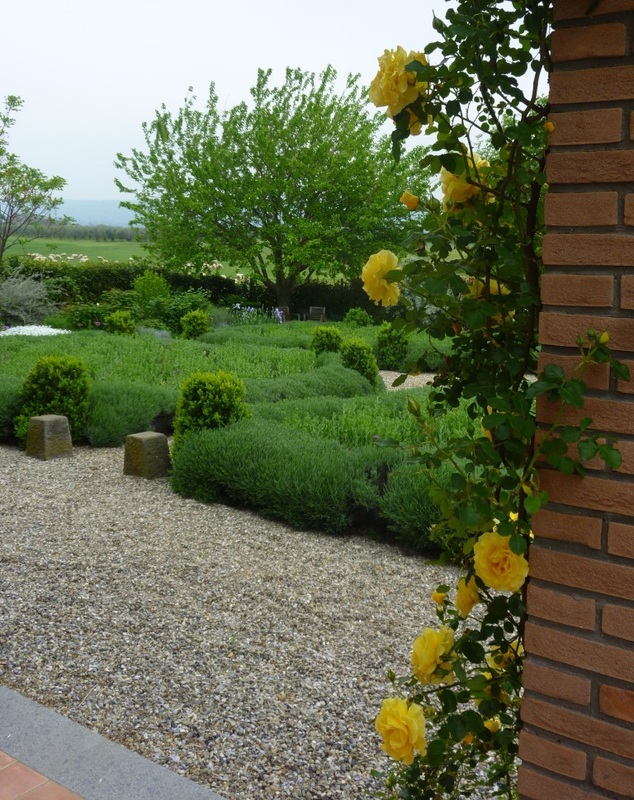 Sorry, I know I promised to post about Tulips combinations to hide their foliage but the roses are beginning to flower and are filling the garden with their perfume; I just have to share them with you. 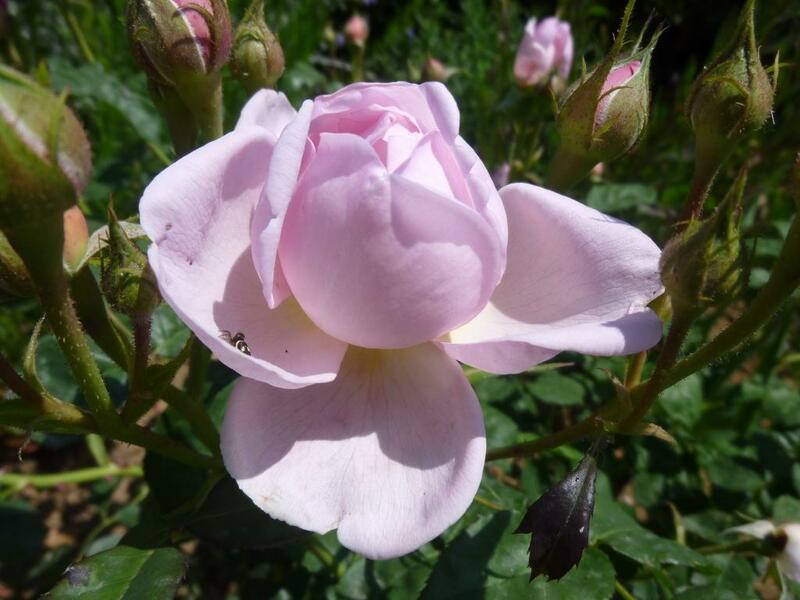 I have to admit that in England, where every Italian thinks they must be perfect, I was never very successful with roses. 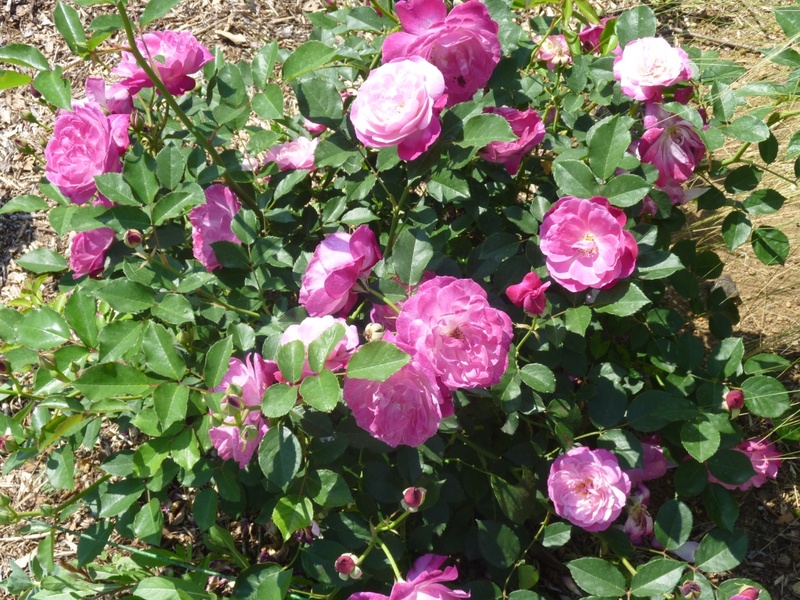 Here is different; they grow more quickly, have the long hot summer for their ‘wood’ to harden’ and dry summers that don’t encourage black spot or other fungal-type diseases. 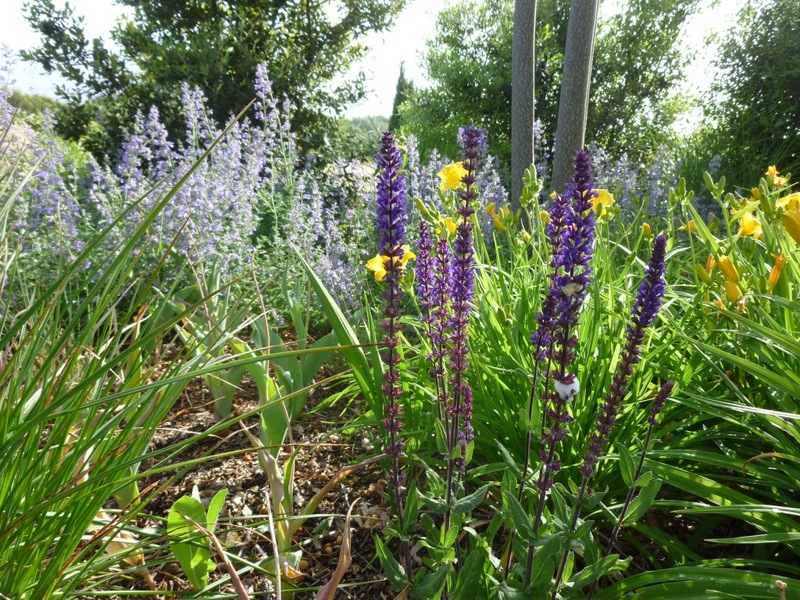 They do begin to flower early, last year some began at the end of March. This year it was mid-April when the first buds opened especially for GBBD. 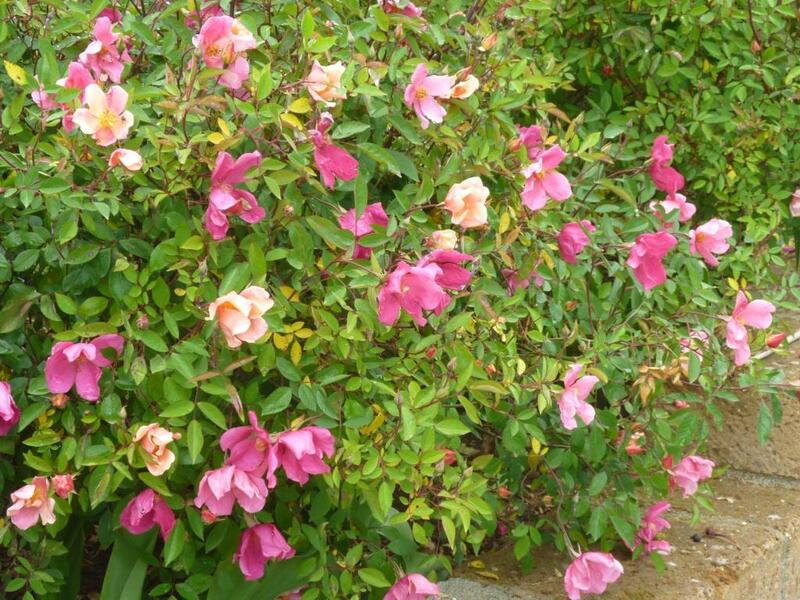 Now Rosa mutabilis is full of colour and on still days gives off a delicious perfume. They are forming a hedge between the drive where we park and the vegetable garden. These images are the end of April. 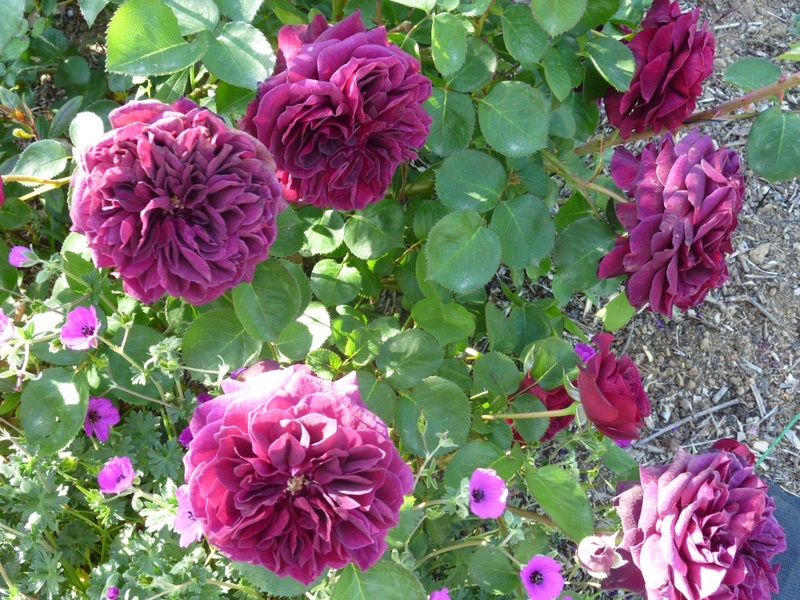 Next into flower were R. Conrad F Meyer and R. Stanwell perpetual. 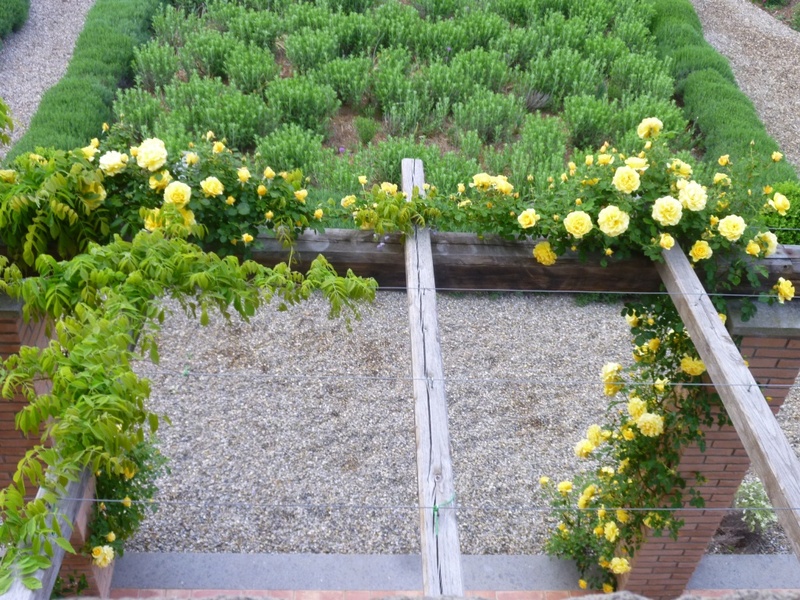 Both are in the Triangular Rose bed that links into the walled bed you can see above. 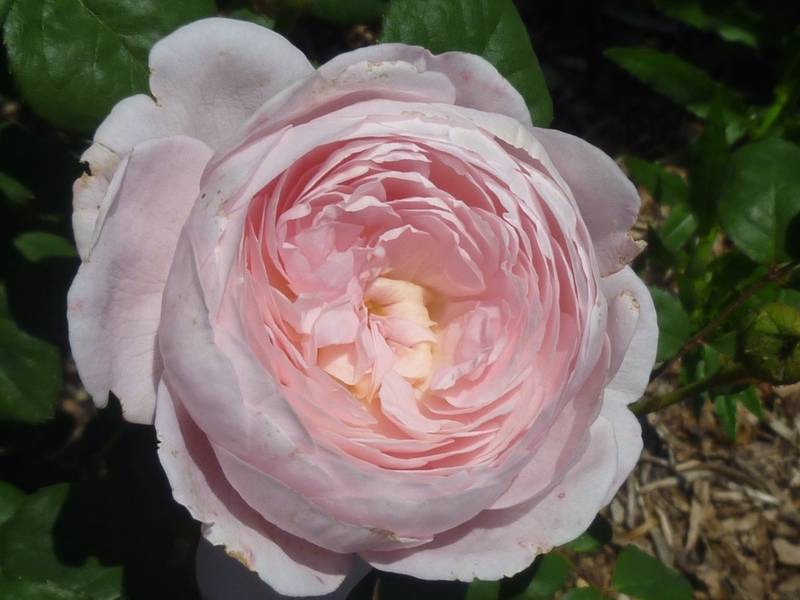 Stanwell perpetual opens pale pink but quickly fades to white. 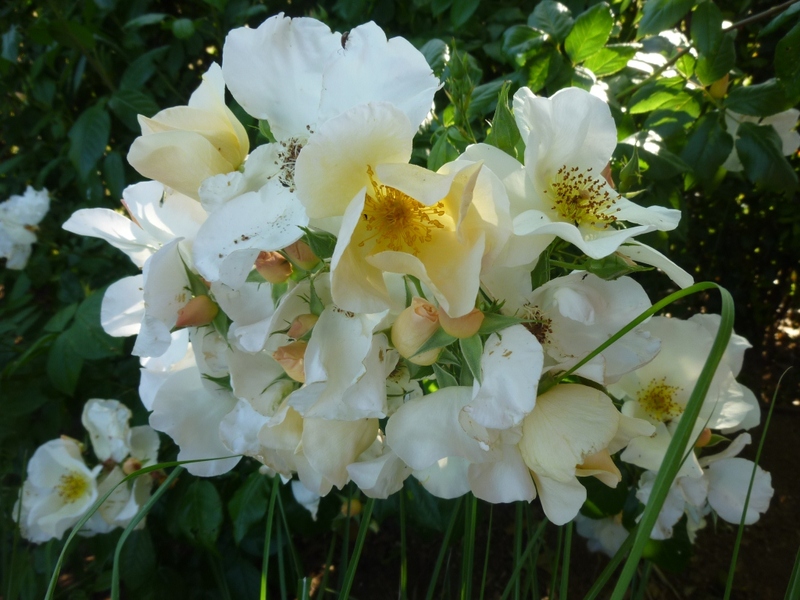 This is a very generous rose with masses of blooms over a long flowering season. 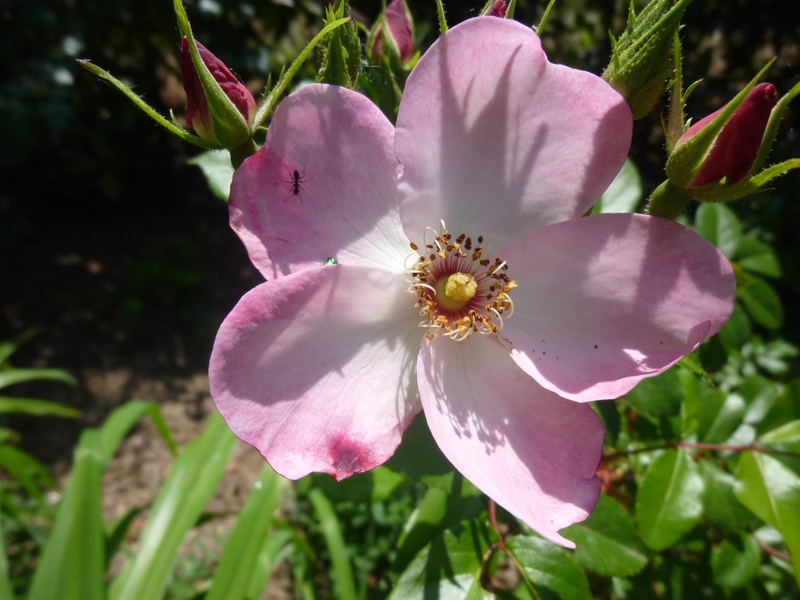 R. Molineux also opens early and last year (its first year) surprised me by how long it flowered. 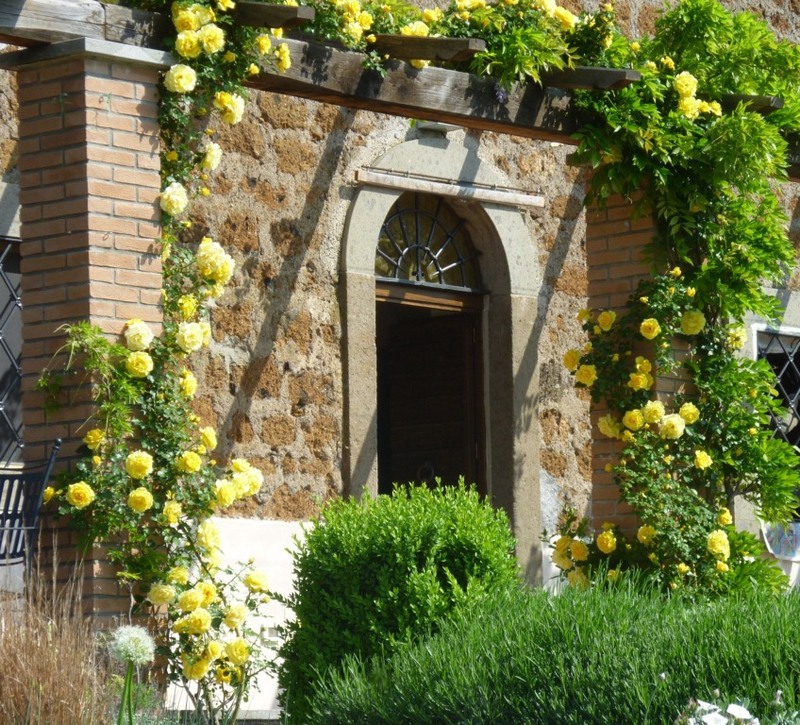 What is giving me most pleasure at the moment is R. Rimosa (known in the US as climbing Gold Badge and in the rest of the world as Climbing Gold Bunny) it is planted on 4 of the pillars at the front of the house along with Wisteria prolific, which I’m sure you saw in my earlier posts. 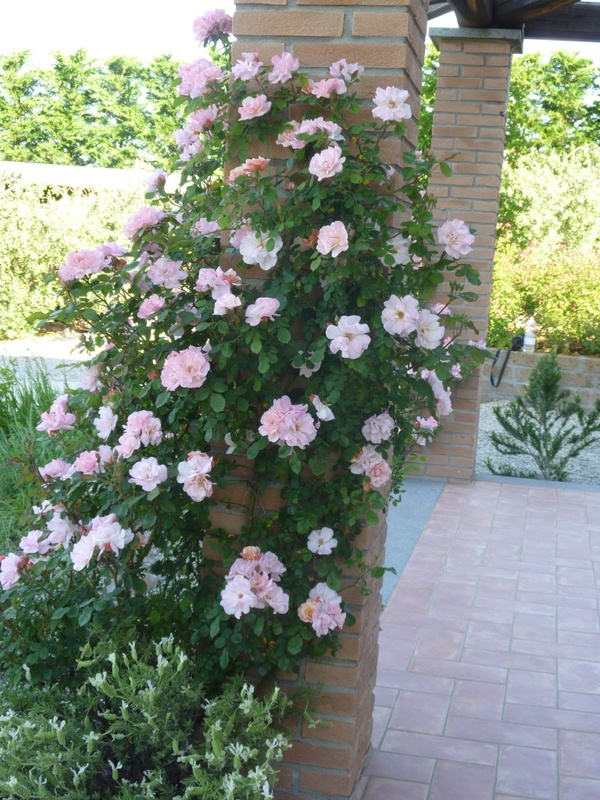 I choose this rose because at the nursery, when I saw it in mid-September it was flowering right from the base, and that is just what it is doing now, it has even grown taller than I imagined it would and it has linked up to form an arch of roses when I look out of the sitting room or kitchen windows. This too is delicately perfumed. 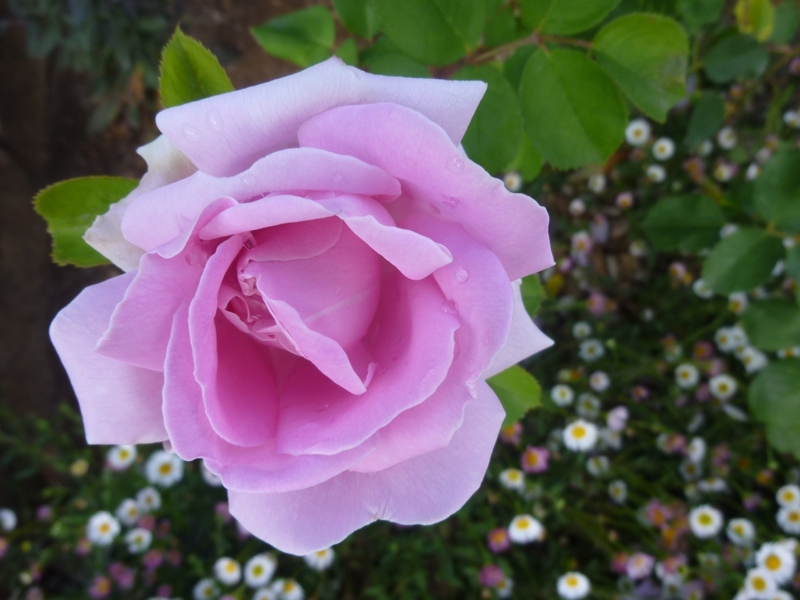 When I planted this rose with the wisteria I did think they might flower together creating a good contrast, but usually the wisteria has more or less finished before the rose comes out. 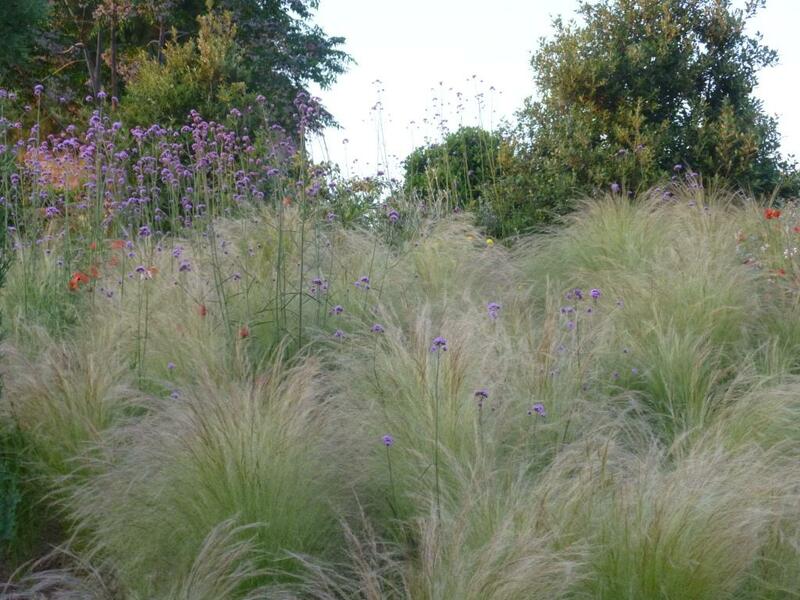 It does make an interesting combination with the Perovskia when it re-flowers in autumn. 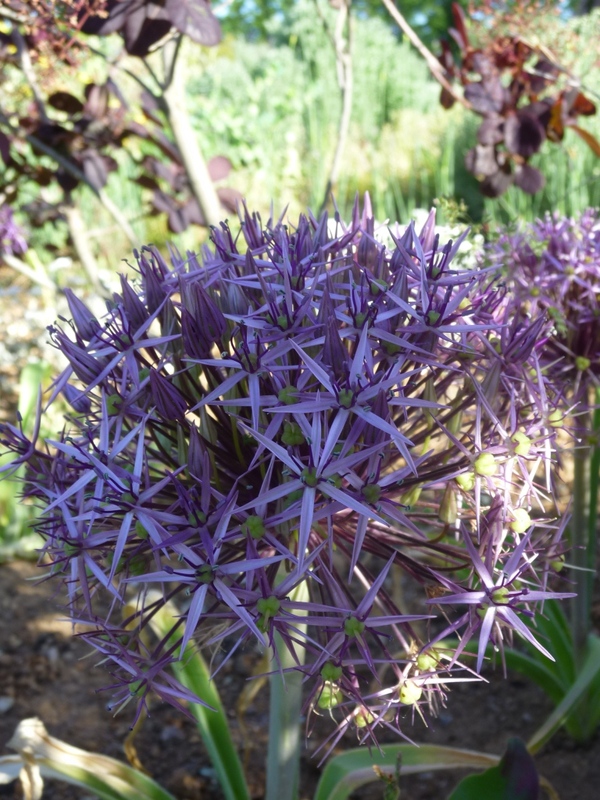 Enough of the roses for now; A friend posted about her alliums this morning and I was surprised that hers, in North Devon, were at exactly the same stage as mine here in Lazio. 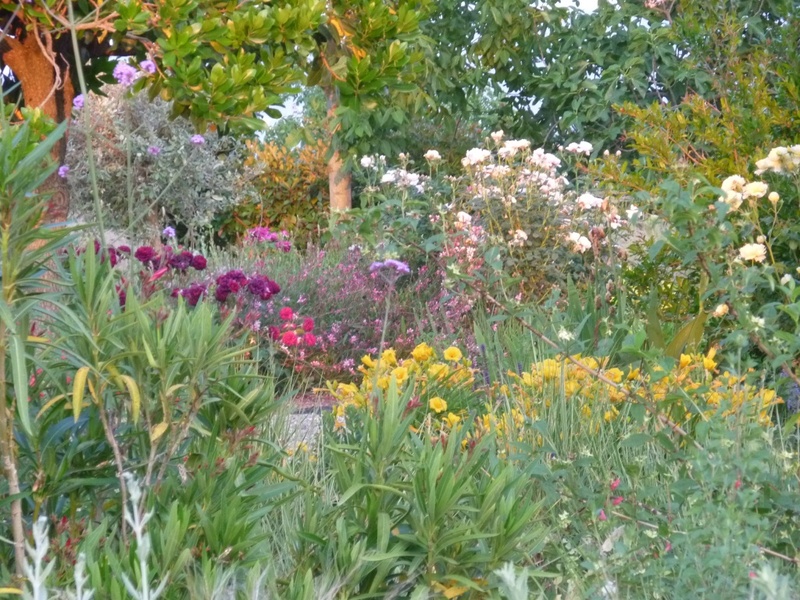 The garden is the most full and colourful I’ve ever seen or even dreamed it could be! (the downside might be that in autumn many plants will have outgrown their space and need to be moved) but at present I’m just enjoying the show. 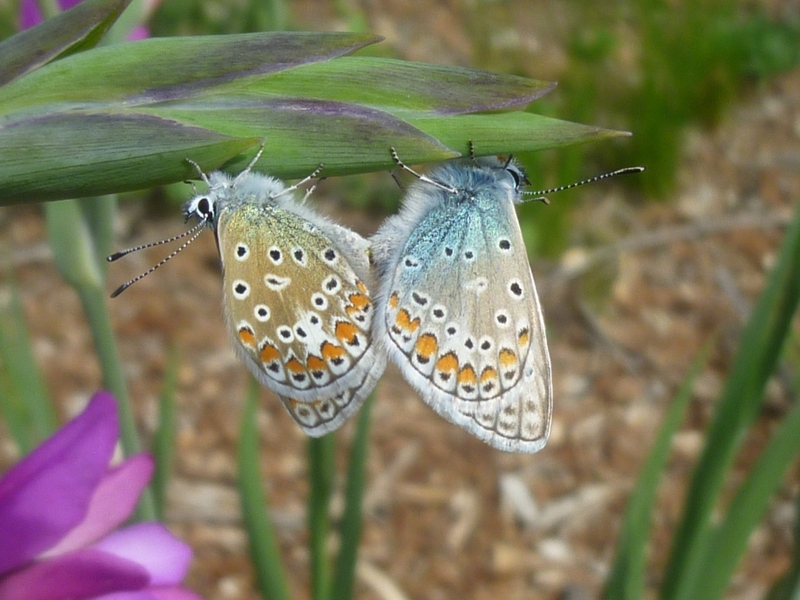 To finish and a reminder of the wildlife I love to see in the garden here is a lacewing and 2 blue butterflies doing what butterflies do! 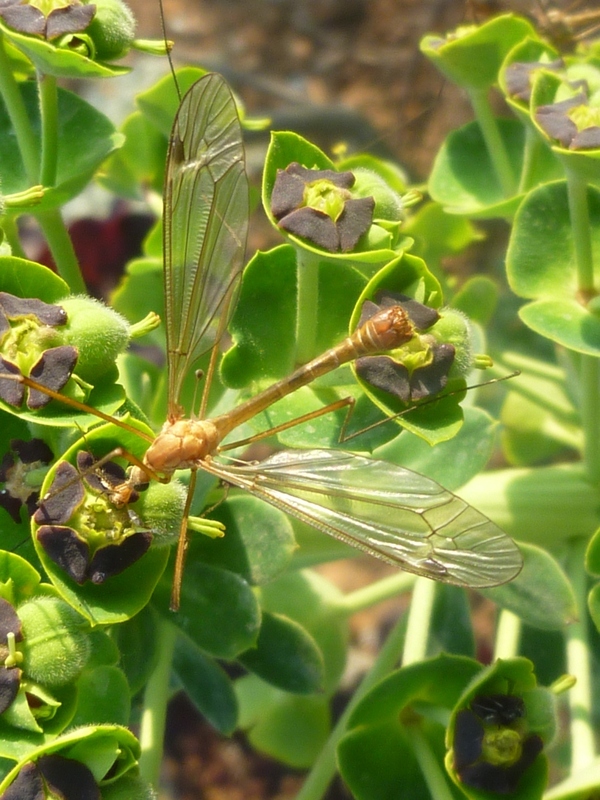 A Daddy Long Legs feeds on a Euphorbia.